A candle gets its flame from combustion, a chemical reaction. The hydrocarbon that formed the candle reacts with oxygen, and we get carbon dioxide, water, and heat energy as the results. The oxygen is obtained from the air. If the air supply is cut off —for example by covering the candle with a glass— then the reaction will stop, and the flame goes out. We hear flat-Earthers often claimed that it is impossible for the Sun to be in space. They said the Sun burns, and therefore it requires oxygen. Space is empty, so it is impossible for the Sun to be there. They are wrong. 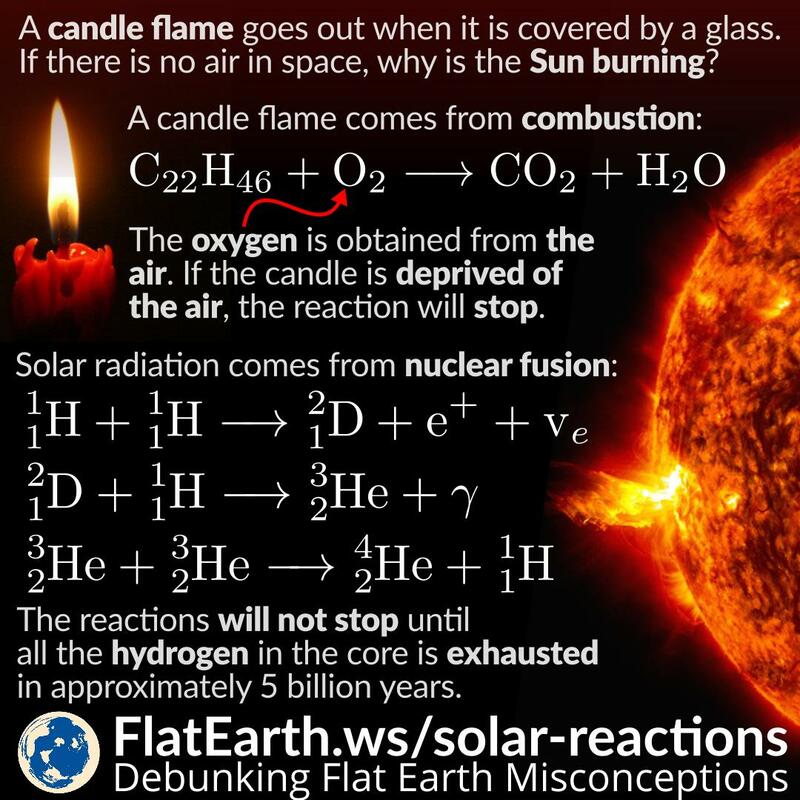 The reaction that is occurring in the Sun is not combustion. It works differently from what happens with the candle. Nuclear fusion powers the Sun. It fuses hydrogen atoms into helium atoms. All the necessary component for the reaction to happen is in the Sun, and the reaction doesn’t require matters from external sources. If the hydrogen atoms exist on Earth, then why a nuclear fusion doesn’t happen on Earth like in the Sun? It requires an enormous amount of hydrogen for the fusion reaction to occur. Because of its vast mass, the core of the Sun gets squeezed from all directions, allowing the nuclear fusion to happen: hydrogen nuclei combine to form helium atoms. The reaction inside the Sun will happen until all the hydrogen in the core is exhausted, in approximately 5 billion years. How can we determine the composition of the Sun? How can we know the reaction that is happening inside the Sun? How can we determine when the Sun will die out? We can determine the composition of the Sun using spectroscopy. Different matter absorbs different wavelength. By analyzing sunlight, we can determine the composition of the Sun. Even the composition of distant stars can be determined from their light that we receive on Earth. Direct evidence of the reaction happening inside the Sun came from neutrino emissions. Neutrino is denoted by ‘ve’ in the diagram. The existence of neutrino was proven for example by the Super-Kamiokande facility that was built 1 km underground. By measuring: 1. the energy emitted by the Sun, 2. the total energy the Sun has by now, and 3. the current age of the Sun. The first was measured by calculating solar luminosity. The second can be determined by knowing the mass of the Sun, for example using the Kepler’s law. The third can be determined by performing radioactive dating on matters that was formed during the formation of the Solar System.